Italian food is awesome. And I love it even more when I can make it at home. 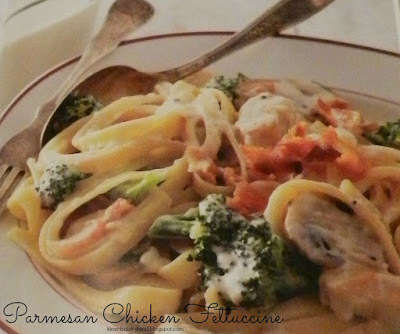 Try all your favorite restaurant flavors in this Parmesan Chicken Fettuccine. There's nothing I love more after being out of town for 20 of the last 26 days than coming home and being able to cook. Eating out gets old really quick and I'd rather cook anyways. This dish is delicious, especially if you love pasta. Bacon makes everything better, so of course there's bacon! I usually post quick and easy meals and while this one isn't as quick as some of the others, but the taste makes up for it. Summers are pretty busy on the farm. There's hay to make, animals to feed, cows to milk and crops to spray and check on. This has been a pretty rough summer for a lot of the nation. It's been fairly mild here in Indiana, but it just won't stop raining! Crops are drowning and farmers can't get into the fields to spray them with nitrogen, which the crops so desperately need. If you've noticed some of that shorter yellowish corn in the fields, that's definitely not good! I've seen some patches of corn within fields tassling, but for the most part it just looks horrible. It will definitely be an interesting harvest if the weather keeps this up, but just keep your fingers crossed for better weather. If you like mushrooms, you can add them to this recipe. I don't like them so I left them out. Enjoy!! Cook the fettuccine according to the package directions, adding the broccoli in the last 3 minutes of cooking; drain and keep warm. Meanwhile, melt 2 tablespoons of the butter in a large skillet over medium heat. Season the chicken with 1/2 teaspoon of the salt and 1/4 teaspoon of the ground pepper. Cook in the hot butter until cooked through, 5 to 6 minutes. With a slotted spoon, transfer the chicken from the skillet to a plate; set aside. Add 2 tablespoons of the butter to the skillet. Cook the onion and garlic in the hot butter just until the vegetables are softened, 4 to 5 minutes. Set aside. Combine the remaining 1/2 cup of butter and the heavy cream in a medium sauce pan over medium-low heat. Heat and stir until the butter is melted, about 2 minutes. Stir in the remaining 1/4 teaspoon salt and remaining 1/4 teaspoon ground pepper. Add the Parmesan cheese and stir until the cheese is melted. Stir in the chicken, onion mixture and half the bacon. Toss the drained pasta and broccoli with the chicken mixture. Divide among 6 serving plates. Top with additional grated Parmesan, the remaining bacon and cracked pepper.